Like upriver impoundment Weiss Lake, Neely Henry Lake, the second of six lakes located on the Coosa River System, suffered from the results of an extreme drought this past summer. Unseasonably low lake levels of two feet below normal, full pool existed during the 100 plus degree days of mid August. Although not as drastically down like Weiss Lake (down 5 feet in August) this still created a hazard for boaters. Normally lowered during the fall season for winter pool, Neely Henry Lake could be dropped even lower than two feet for the next six months until next spring. Low water is not good for the lakes aquatic weeds, that usually thrive and grow thick and green during the summer months on these Coosa River Lakes. Also without the weeds, bass and the baitfish they dine on have to find other places to resident during the summer months. With very little weeds growing during these low water times, the beginning of the fall period can show both the bass and the baitfish, crayfish and other edibles hanging around wood cover, rock cover and irregular bottom features. They can really get bunched up in preferred locations. Although Neely Henry Lake is a big lake (at over 50 miles in length), low water can still congregate both predator and prey overcrowding them around shallow water cover. 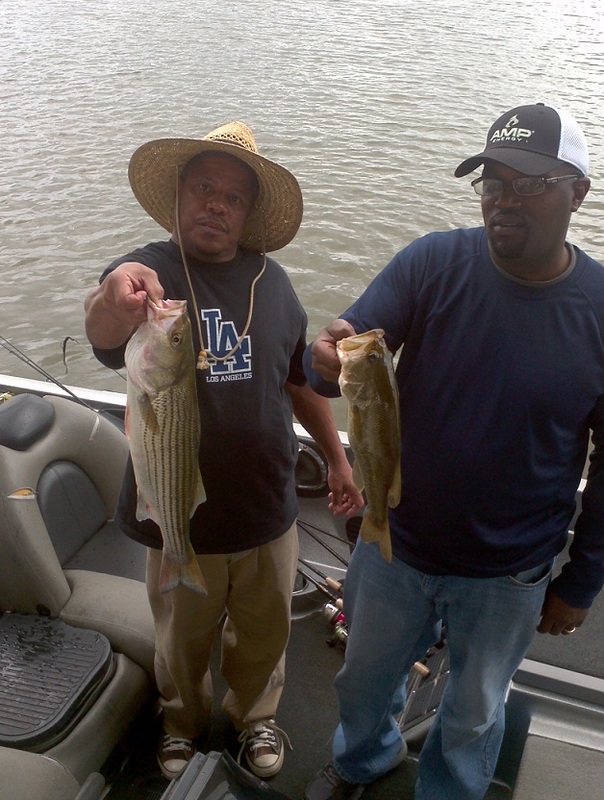 This situation can increase the feeding activity of both the lakes spotted bass and largemouth bass population as waters drop and begin to cool in late September. Low water can show the lakes headwaters really concentrate these fall season bass. The lakes headwaters being considered about 25 miles of narrow river type waters situated from Gadsden City launch located right next to Hwy. 431 bridge crossing, to Weiss Lake dam tailrace waters. There are very few backwaters in the upper reaches of Neely Henry Lake, places deeper than 5 feet (especially so with the lake down a few feet) for these fish to escape the often swift current found here. The relocation of both bass and prey such as minnows, shad, bream and crayfish, can funnel them all down to these creek mouths. This includes the mouths of small incoming streams, small cuts, pockets found along the main river and especially main river banks featuring slack water and lots of wood cover. Also there are flats and plenty of rock bluffs for these fall bass to feed along as these seasonal waters begin to cool and winter approaches. Points leading into these river type rock bluff pockets are excellent places to fish this early fall season on into early winter using topwaters, spinnerbaits, crankbaits, worms and jig combos. During the fall and early winter months the lake can have a sudden influx of water from heavy rains, which can stain the lakes headwaters and cause the lake level to suddenly rise. This is when anglers fishing the lakes headwaters can quickly capitalize on a shallow water bite before waters clear and drop back down. Fishing very shallow in major feeder creeks in these lakes headwaters (as waters suddenly rise from several inches of rain), can show some really big bass coming out of the muddy river and suddenly invade the newly flooded shallows, to feed right before waters begin to drop back down and suddenly cool with the next cold front. Henley Creek and Cove Creek are the last major feeder creeks showing depths of five feet in these lake headwaters, even when the lake is down two feet. Flats in these and other creek backwaters can show lures like spinnerbaits and noisy topwaters like buzzbaits good lure choices in lightly stained waters during fall for big bass. Leaving Gadsden City launch and heading down the lake you will notice the lake begins to widen to a more lake like appearance. Although wide open main lake flats with stumps and scattered wood debris are clearly evident, the lake is lacking in backwaters and major feeder creeks until you reach the lower lake where Canoe creek is located. The only major creek in this mid lake area is Big Wills Creek, located on your right heading down stream about 2 miles below Gadsden City launch. It has a lot of man made rip-rap rocks found around bridges that are good fishing with shad imitations and crayfish lures. 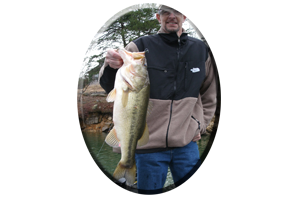 Crankbaits, rattling lipless lures and spinnerbaits are good lures fished at all depths along the rocks. Also try small finesse worms on jig heads to big worms rigged Texas style, including lizards, tube baits, crayfish imitations, creature baits and jig combos, all fished very slowly from shallow to deep water along these rocks. Main lake flats loaded with stumps, laying trees and logs are great fall locations for numbers of spotted bass and largemouth’s. There are miles of these flats from Gadsden City launch located all the way to the mouth of Canoe creek down the lake. Fan casting lures like shallow to mid running crankbaits, both floating and suspending hard bodied jerkbaits and rattling lipless lures like rattletraps, Cordell ratting spots and Rapala’s Rattlin’ Raps covers these flats fast and gets the anxious bass bites. After catching a few bass on these flats you should rework them with topwaters, bottom lures, spinnerbaits, floating worms and soft jerkbaits. Baitfish really gather here during the fall season and bass can often be seen schooling and busting shad on top. Always have a topwater lure rigged and ready for this fast schooling action. Another tactic many anglers pass right by are fishing bridge pilings during the fall. Not only the three bridges located right next to the city of Gadsden that borders the lake, but Hwy. 77 bridge that crosses the lake a few miles above the mouth of Canoe Creek. 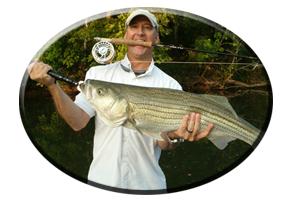 Jigging spoons or fishing with small worms, jig heads with spinners or even topwaters are good lures fished right along the bridge pilings. Backing off and making long casts with lures such as deep diving crankbaits is one tactic that works really well, especially when fished along the much shallower bridge pilings near the main river banks. Keep in mind, washed in wood cover is found all along these bridge pilings. Also there is man made rip-rap rocks dumped all around each pilling at its base to prevent erosion, rocks that bass like too. Neely Henry Lake takes on a more lake like appearance as you leave the Hwy. 77 bridge crossing and head down the lake. The mouth of the lakes biggest feeder creek Canoe creek, once displayed miles of standing timber found everywhere on the lower lake. Now those trees have been cut off far below the water line, but stumps still remain, good places for some very unmolested bass this fall season. High spots, main lake points, some small islands and old underwater lakes and roadbeds also exist here. Plenty of piers and boat houses featuring resident planted brushplies can be easily found in this lower lake region. These piers have resident planted brush all around them and plenty of bass relating to them as well in the fall and early winter seasons. Some map study and depth finder use will reveal the hidden spots. Other places bass inhibit during fall (that are more visible) include brushpiles. They are very visible with low water now exposing limbs and small sticks protruding out of the water. With low water this fall, watch out for shallow places, some are marked areas with PVC pipes and they are very evident. 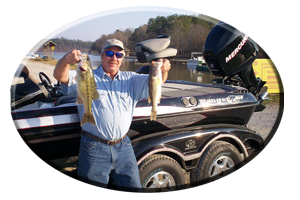 Covering water fast and finding the more active bass always involves the use of lures that simulate shad or bream. In shallow water of less than five feet featuring clear water clarity, try smaller profile lures like shallow to mid running crankbaits, small rattletraps and small two hooked jerkbaits. Also you may try smaller topwaters and smaller spinnerbaits. 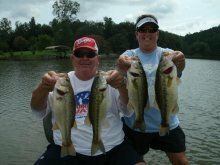 These lures may be needed for finicky bass on these lower lakes fishing in and around wood and rock cover. But often smaller lures do fool the bigger more picky bass as well. 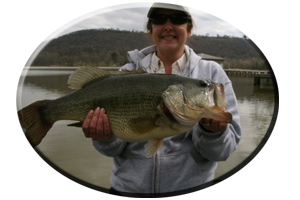 If these main lake flats, the mouths of creeks and even creek backwaters are stained from heavy rain or current is very evident, you may need to help the bass locate your lures more easily. Lures like spinnerbaits emit more flash and create more water displacement with the vibrations from the lures blades and the action and appeal from adding trailers. 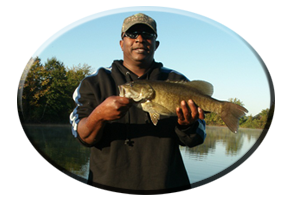 Spinnerbaits are excellent lures in stained to off colored water conditions during the fall. Brighter colors may be needed. Half ounce to three quarter of an ounce rattletraps and Cordell rattling spots put out a lot of noise, flash and vibration. These lures also look like end of the season shad these bass feed on, baitfish that have grown bigger by the fall season.